Britain's most famous living artist David Hockney has always been keen to embrace new technologies in his work, most recently developing a passion for iPhone paintings from his new home in Bridlington. And while Hockney continues to knock out his traditional, huge colourful canvases of the north country dawns, he has also been sending out hundreds of smaller iPhone paintings to his friends over the last year. 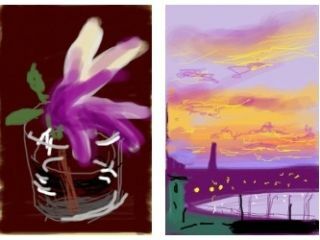 As soon as Hockney discovered the original Brushes app on iPhone he realised the artistic potential of Apple's mobile internet device. "Over the past six months, Hockney has fashioned literally hundreds, probably over a thousand, such images, often sending out four or five a day to a group of about a dozen friends, and not really caring what happens to them after that," notes The New York Review of Books. "Although the actual drawing, when I do it, goes quite quickly," explained Hockney, "some days it might be preceded by hours and hours of thinking through just how one might achieve a certain play of light, texture, or colour." Hockney is particularly taken with the new opportunity to draw the dawn over Bridlington that was never possible before, because "in the old days one never could, because, of course, ordinarily it would be too dark to see the paints; or else, if you turned on a light so as to be able to see them, you'd lose the subtle gathering tones of the coming sun. "But with an iPhone, I don't even have to get out of bed, I just reach for the device, turn it on, start mixing and matching the colours, laying in the evolving scene." In an ode to the artistic potential of Apple's smartphone, Hockney adds: "It's always there in my pocket, there's no thrashing about, scrambling for the right colour. One can set to work immediately, there's this wonderful impromptu quality, this freshness, to the activity; and when it's over, best of all, there's no mess, no clean-up. You just turn off the machine. Or, even better, you hit Send, and your little cohort of friends around the world gets to experience a similar immediacy. There's something, finally, very intimate about the whole process." The artist sees this 'primordial calling' going all the way back to the early cave painter "scratching away on his cave wall, me dragging my thumb over this iPhone's screen. All part of the same passion."